I am extremely fond of this early history of Cache County and the greater Cache Valley, I have read and then reread it several times. I have an original typescript copy of all included here and it has helped to form the base of my understanding of early Cache Valley history. This history seemed to be well known by many local historians, but hard copies of same were not to be found, being published in the local newspaper, The Journal and not bound in formal book form. It was this lack of easy availability that prompted me to try and help out the local historical community. I first placed a long one-page html copy of “An Early History of Cache County,” by M. R. Hovey, on the Internet sometime in early 2000. Due to the sheer size of this tome, compiled by Merlin Ross Hovey, on the greater Cache Valley, I have broken the history up into its individual topics and or chapters, to facilitate your movement among the sections. The index below will serve as the main page at this time; I have placed foreword and back buttons on the pages to help move you to the next section and an index button to return you here. I hand typed all of the text included herein and built all of the tables and etc., thus any mistakes are none other than mine. I release this as such, knowing though I have done my best, there will be some typos and or other such errors introduced. A work of this size, completed by only one person typing and proofing, even with a good spell checker, at times just lacks the perfection I seek and you need. If you the user will help alert me to the errors found, I will promise to promptly correct same. I hope to include some photographs and some graphics, charts and other enhancing elements or features over time. Regardless— I believe the work very serviceable as found, for current needs. As noted prior, it will only improve over time as serious students of Mendon and Cache Valley history use and help to improve it. Ultimately however I must bear the burden and responsibility for any errors alone. 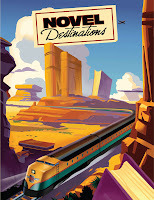 Join in the summer reading fun from June 8 thru August 3, 2011. You will have a chance to read books, and win prizes. For every book you read simply come to the library and submit an entry form into our drawing. Every few weeks we will draw random winners who will get to select from a variety of prizes which include: browsing bags, T-Shirts, reading journals, sticky note blocks, bookmarks and more. Participate in the Teen Summer Reading Program and earn prizes just for reading. Students who will be going to grades 6-12 in the coming school year can participate in the teen program. You will get a chance to win a prize for every book you read this summer. Simply come to the Library and submit an entry form for each book you read. Every few weeks we will draw random winners who will get to select from a variety of prizes such as bags, T-Shirts, notepads, magnetic bookmarks, color changing pencils, and many more. Sign Up at the library, then read 20 minutes each day. You many count the time you spend reading books, comic books, newspapers, or magazines. You may also count the time you spend listening to books that are read to you, or to recorded books. You choose what you want to read! Keep track of your reading on your Reading Log ( you'll get one when you sign up) and you will get a prize when you bring the completed card back to the library. You can earn up to eight prizes this summer, just by reading. There will be drawings held every few weeks for bigger prizes, and a final drawing at the closing party for T-Shirts, reading bags, and other great prizes. The Reading Logs will be your entries into the drawings. Summer Story Time will be held each Thursday throughout the summer at 10:30 for those 7 and younger, and 3:30 for those 8 and up. July 23, 2011, 1-4 P.M.
We have been making changes at The Literate Mother! We hope that our new layout will make it easier for you to find the books you're looking for. Please take a few minutes to visit us and check out our new look. We would love to hear what you think! Leave a comment on our site by Saturday, March 5 and we will enter you in a drawing for a signed copy of Gifted by Karey White. Look for clear uncluttered pictures that are easy to "read." Little stories that reflect the child's own world are most appropriate. turning pages is still difficult. Choose books you won't mind reading over and over. Children love repetition. Children love repetition. I am happy to announce our spring book sale will be March 22-26 at the Hales home in Logan from 9:00am to 12:00 pm. I so excited about some of the new books I've reviewed and ordered. I hope you will be too. I also was able to track down a pop-up book of the Sound of Music that is just beautiful! I have found a number of out of print picture books in spanking new condition too. Hope to see you here. My phone number is 435-752-7253 if you have any questions. P.S. I now have a website called www.thebookladysdaughter.com that highlights the best books for children of all ages. Mom's booklist is included and I have up dated it since her death. Take a look around the website and let me know if you have any suggestions or ideas. Children this age need books that explore morals and values. Nonfiction can be as important as fiction in expanding horizons and interests. Fantasy and legend speak to creativity and problem solving. Reading aloud as a family activity is still a sound idea. Discuss books and encourage independent choices. 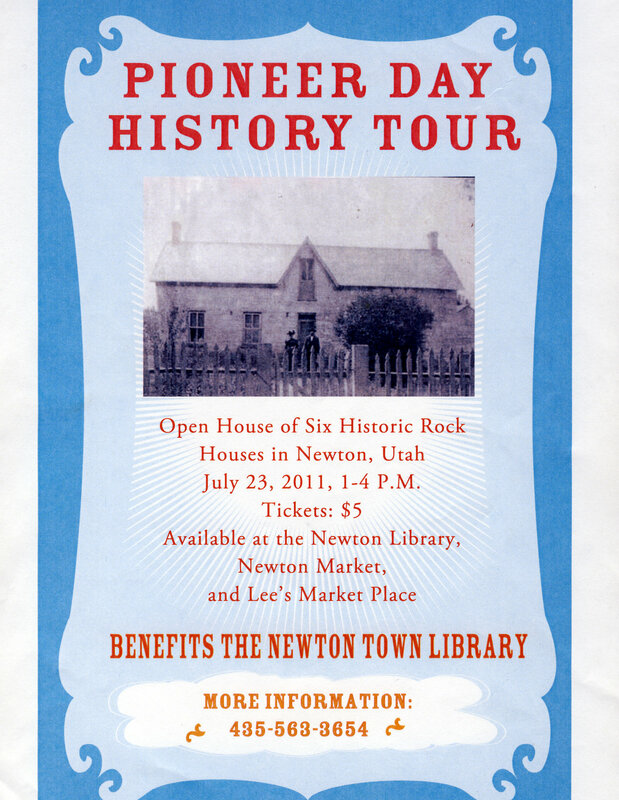 NEWTON, Cache County — In a town of 803 people, one market and about 2,400 cows, a room filled with 25,000 books is something to marvel. Besides supplying the main ingredient for gourmet cheddar cheese, this small dairy town's claim to fame is that it has the smallest certified library in Utah — a remarkable feat when you consider that 12 years ago you had a better chance of being beamed up by space aliens than getting your hands on the latest Stephen King. 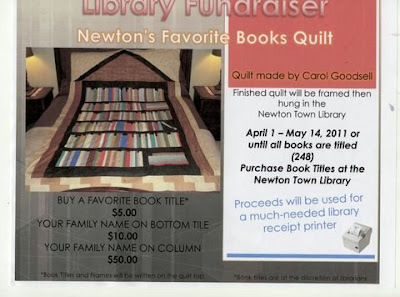 Best-sellers were a rare thing in Newton before then, unless families chose to fork over more than $100 for a library card to check out books in Logan, 15 miles away. Now, thanks to dedicated volunteers and a handful of part-time paid employees, the Newton City Library is the hottest gathering spot in town. It's also the only gathering spot in town, but no matter. "We love our books," says library director Sarah Rigby, 37, taking a Free Lunch break from cataloging to share the story of Newton's greatest asset with longtime volunteer Cleo Griffin, 82. "Having a library has opened the world up for everybody in Newton," says Rigby, who has worked there for nine years. "Probably the nicest thing is that when people come in, they're not just another face. In such a small community, I get to learn a little something about every single person in town." 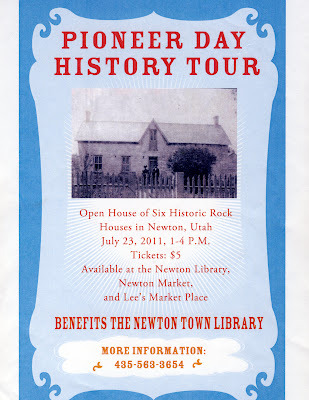 Located in the town's old schoolhouse, the Newton library was started by Griffin, a book lover who grew up in the small town of Georgetown, Idaho, where a visit to the library required knocking on her neighbor's door and browsing the shelves in her living room. "She was a wonderful lady, devoted to providing books for our little town," Griffin recalls. "She introduced me to the classics and helped me develop a love for reading." After she married and moved to Newton to raise a family, Griffin always longed for a nearby place to check out mysteries and historical novels. When she was given the title of literary specialist at her Mormon ward, she decided to take her new task a big step further and start a town library. "My living room wasn't nearly big enough," she jokes, "so we talked the city into giving us a space in the school, next to the town hall. Basically, with $50 and a box of books, we were in business." For 11 years, Griffin worked as the head librarian, cataloging all the books that townsfolk contributed, ordering new books on her limited budget, setting up a computer system and holding children's story time. Now retired, she still comes in several times a week to look after the library's historical archives and browse through the mystery section. "Books are my daily Prozac," she says. "Whatever would we do without them?" Rigby concurs. In a world where a Nook is now a handheld gadget for book downloading, it's nice to have a cozy place in Newton to escape for an hour or two. "Electronic books might be good for some people," says Rigby, who still calls patrons personally if they have overdue materials, "but I think in Newton, most everybody prefers a trip to the library." Good, old-fashioned books, she says, will always outnumber those Holstein cows. "Privacy" button to remove yourself. The first school in Newton was held in Franklin W Young’s home. It was on the lot south of where Pat Dagley now lives. John H. Barker Sr. was the first teacher. The town started a new rock school house in 1872 just south of the town hall. It was not completely finished until 1875. In 1875 the census shows 49 males and 36 females. The school house was 43 feet long and 25 feet wide, with and arched ceiling 16 feet high with a stage across the hall 14 feet deep and 18 inches high..This building was sold for about $100 and was torn down shortly 1908 when the new white school house was built. A. P. Welchman was engaged to on March of 1875 for on school year ( 240 school days) at salary of $40 a month. One third was paid in cash , two thirds to be paid by patrons according to number of days their children attended. ( note the town kept reducing the amount they paid the Mr Welshman) .At one time L George Clark noted that there were as many as 75 students at one time in class. The school reported of having a library with 8 books in it. A special trustee meeting was held in Feb of 1886 to hear a complaint by James Parson against Mr Welchman for punishing his son. The following conclusions were arrived at. Detaining children after School hours concede to the teacher , but with advice to use cautiously , of the particular in reference to large scholars, females especially. Corporeal punishment admitted, under similar restrictions: and further more this it should never be inflicted on the head. The palm of the hands were suggested. A certain strap used by Bro Welchman was allowed under the foregoing restrictions. TICKETS ARE REQUIRED FOR DINNER, GET THEM FROM ANY DUP MEMBER, SO WE WILL KNOW HOW MANY ARE COMING. Exhibit held at the Newton LDS Church on Friday , January 28th 2011. Please submit your art work to the Newton City Library on or before 22 January 2011.